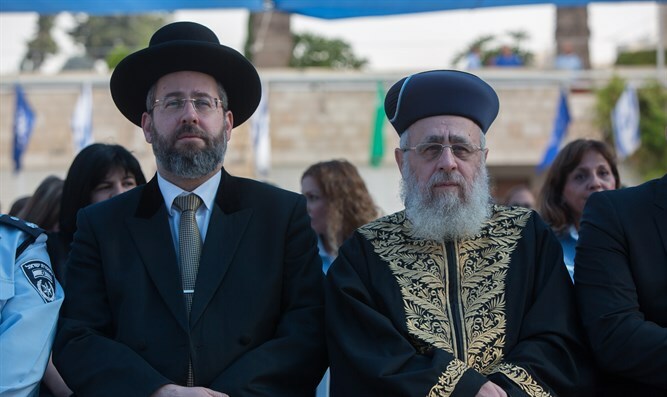 The Chief Rabbinate Council published a special statement this afternoon (Thursday), against the backdrop of the infrastructure construction conducted by Israel Railways on Shabbat, and the subsequent coalition crisis and national debate around the matter. The continued existence of the Jewish people is miraculous. There is no other nation in the world that hs survived the kind of persecutions and upheavals that the Jewish nation has, and still remained intact. One of the unique things that have been integral to this survival, is Shabbat. Shabbat is the symbol of the covenant between the Jewish nation and God, and represents the continued existence of the Jewish people more than anything else. It's also the pillar of Jewish faith in the creation of the world. Already at the time of the establishment of the state of Israel and nation's return to its historic homeland, the leaders of the Jewish presence here saw the importance of preserving the sacred principle of Shabbat. They also understood that without Shabbat observance in the public space Judaism will not survive in the land of Israel. Recently, some have decided that it's appropriate to trade in the holiness of Shabbat. And so they've suggested all sorts of possibilities of changing the face of the country on Shabbat. Even if, unfortunately, the reality has been changing, that is no good reason to legitimize Shabbat desecration. Indeed, Israel is not like other nations. To our great sorrow, in our generation, longstanding norms have changed. There are those who are attempting to instill in the hearts of the nation principles that are fundamentally opposed to Judaism. This isn't only happening with regard to Shabbat, but also the holiness of the Jewish home and other matters. The Chief Rabbinate Council calls on everyone: Leave the holy Shabbat alone! Shabbat is not for sale or trade and there is no room for compromising its holiness. We must strengthen our stance on the holiness of Shabbat in order to try to prevent a situation where, heaven forbid, the Shabbat is publicly desecrated everywhere. Woe unto the generation in whose time this principle that is fundamental to the spiritual life of the Jewish nation is undermined. In the merit of determined defense of Shabbat observance, we will merit the final redemption, as the sages said: "If Israel would only keep Shabbat properly but twice, they would immediately be redeemed."